One of the fun parts of my job is that occasionally people come to me to ask for advice about the best campaigning tactic to use. (Let me know if I can bring my campaign advice clinic to you – I’m serious). A few months ago, an organisation approached me asking if they should launch a petition for their latest campaign. Its a good question, in the days when petitions with 200,000 names in hours feels like a regular occurrence, where to start can appear daunting. Here are a few thoughts that I shared. 1. It’s not simply about the numbers – Over the last few years we’ve been experience an petition arms race. Some groups are able to rapidly mobilise 100,000s of people to sign a petition. Looking at those numbers it can feel intimidating to start a petition, but when it comes to petitions, size doesn’t always matter. Instead its about being clear about what your looking to demonstrate with the petition, a well targeted petition with a few thousand names can also be effective, or adopting a more creative approach which Scope have used brilliantly. Having said that, petitions that linger on a few thousand names probably aren’t the most effective way of influencing change. 2. Remember a petition is just a tactic – campaigning isn’t just about getting more names on a petition, its about change and other tactics are available. Identify and be clear what role your petition is going to have in delivering your change outcome. Saying, we’re doing it because we’ve always done it, isn’t an especially good reason. Be clear are you looking for your petition to put the issue on the agenda by showing public support, or providing a target with a public mandate to do something (‘over 20,000 people have called on me to’) or demonstrate solidarity with those impacted by a policy change, or something else. Remember opportunity cost, I’m yet to find a campaign that isn’t resource constrained. So if you decide to do a petition then you need to consider what tactic or tactics you can’t deploy as a result. Check you can’t achieve your outcome through other means. 3. Be clear on how long you want to run the petition for – I think you get two types of petitions at the moment, the ‘short-term and focused’ petition which is linked to a specific moment or policy change that your looking for (this is the bread and butter of platforms like change.org) and will be most effective if it can highlight a particular individual your looking to target, or the ‘long term and broad’ petition which can run over several months, which can have a wider policy ask, the One Campaign use these really well. Both can have a role, the later can be repackaged to respond to different opportunities, while the former probably has a much tighter shelf life but can help to provide a opportunity for people to respond to something in the news. 4. If you do it, do it well – There is a not-so-secret source behind the formula that 38 Degrees, Avaaz and Change.org use. They show a clear link between the petition and the result your looking for. So be specific and realistic in what your asking for, make the most of an crisistunity (that might mean holding back launching your petition until a moment when the media is interested in your issue), and have a compelling reader focused theory of change (if you do this, then we can do this, which means this will happen). The change.org model of ensuring a strong personal narrative from the petition starter is also a brilliant approach. 5. 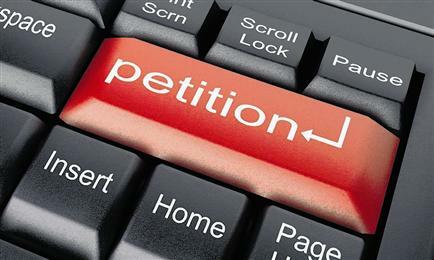 Make it easy to sign – remember not everyone is going to sign on to your petition from a desktop computer. Make sure your petition is mobile friendly, or go old school and have it available as a paper petition as well. Check that you’ve thought about the supporter journey after they’ve signed your petition. Can you use the signer to be a multiplier? When will you feedback to them about the impact it’s having? Can you invite them to take another action on your behalf? But please, and I’m a purest on this, don’t just run the petition to collect names for your next fundraising push. 6. It’s what you do with it that matters – Think about how you use the petition to leverage more profile for your campaign. The change.org approach ensure that the petition has at least 3 media moments, the launch, when it hits a significant number and then the handover. Make sure your plan a handover that will lead to a great photo which you can use in the media or with supporters, or use hitting a sigificant number to launch a policy briefing off the back of it. One extra tip I’d add: think about what data you want from the petition. That’s both a matter of what do you ask for when people sign the petition, and also what petition platform you use as some of them are rather parsimonious with what data they let you take away about your own petition signers. Great blog Tom. I would just encourage you to reverse the order of #1 and #2. Petitions are useful but they are incredibly over used and in so many cases, seem to be the first order of business rather than the last. I have been reading up for a solution but as of yet have been unable to find one. Change.org are not available for advice, assumingly as they are so busy, so how can a petition do well when its not advertised on line,even after paying to support it? Thanks for your comment. It depends a little on what you’re petition is on. Change.org is a good start, but 38 Degrees would be another option as they the Campaigns by You platform for issues based in the UK and have a team able to support if your petition. But they all provide support by promoting via your own personal networks first. Hope that helps. Let me know if you’ve got any more specific questions. Hi Tom, thanks for this. I’m researching the best method & platform to petition for change within the U.K. healthcare system. I have a rare condition (google ‘Save Samantha Manchester/UK). It’s labelled rare but it’s actually quite common… (rare just means under funded & researched). The condition has now led me to fight for my own life do rthe 3rd time in just 12 months. The U.K. do not train healthcare professionals to understand, treat or manage this condition and treatment is only available in the USA . In just 8 weeks last year, we fundraisied over £200,000 for my lifesaving neurosurgeries in the US. I now need another one. This surgery is offered to many other conditions at a cost of £7,000 per time to the NHS, but due to a lack of professional understanding/education; the U.K. have put me on palliative care and are unable to offer the surgery, aftercare (neuro rehab) or basic care within the NHS or private sectors. I am one of thousands in ENgland alone with this issue left fighting and fundraising for life. We need a care pathway for people with this genetic condition. I originally did a parliament petition which hit 13,000+ signatures within 4 weeks. The government response was dismissive, neglectful and unsatisfactory as expected. I am now looking to push for greater awareness and place a larger pressure upon the department of health and ‘decision makers’ to design and implement a care pathway for this condition.